German troops invade Norway. Together with son Ernst and his wife Esther, flight over a period of several weeks to Tromsø in north-west Norway via Molde and the Lofoten islands. In Åndalsnes and on the Lofoten, the refugees are briefly detained by the Norwegian and British military administrations. Crosses to Scotland on the icebreaker Fridtjof Nansen. 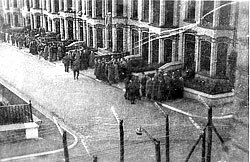 Internment in various camps in Scotland and England: for ten days in Midlothian (south of Edinburgh), two weeks in Edinburgh, six weeks in York, some four weeks in Bury near Manchester, and from 17 July onward in Hutchinson Camp in Douglas on the Isle of Man (until 21 November 1941). Sets up a studio in Hutchinson Camp. 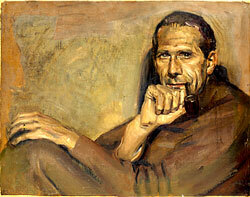 Produces numerous portraits of fellow internees and holds regular recitals (which include silence, his first poem in English) in the artists’ café at the camp. Publishes stories (including The Story of the Flat and Round Painter) in the internees’ journal The Camp. Becomes member of the League of Free German Artists in Great Britain, founded in 1938 by Fred Uhlman. Schwitters celebrates his silver wedding anniversary alone in the internment camp. Contributes figurative paintings to an exhibition in the internment camp. Fire breaks out in his studio. Moves to London, 3 St. Stephen’s Crescent, on being released from internment. First meeting with Edith Thomas (nicknamed “Wantee”), who later becomes his companion. Represented in the “AIA 1942 Members’ Exhibition” of the Artists’ International Association in London. Meets Ben Nicholson and his wife Barbara Hepworth. Moves to 39 Westmoreland Road in the London suburb of Barnes, together with Ernst Schwitters and his Norwegian colleague Gert Strindberg. Holidays in the Lake District with Edith Thomas. Increased production of small abstract (plaster) sculptures. The house at Waldhausenstrasse in Hanover, the site of the Merzbau, is destroyed by an incendiary bomb. Included in the exhibition “The World of Imagination” at Jack Bilbo’s Modern Art Gallery in London. Represented in an exhibition of Concrete Art at the Kunsthalle, Basel. A stroke suffered during a severe bout of influenza leads to temporary paralysis on one side of his body. Participates in conference organized by the PEN Club, where he meets up with Stefan and Franziska Themerson and Lucia Moholy-Nagy. Helma Schwitters dies of cancer. 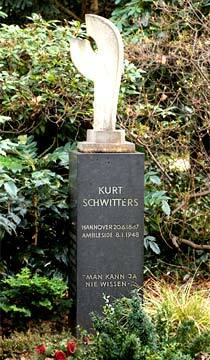 Kurt Schwitters first learns of her death later that year in December. Solo show at the Modern Art Gallery in London; introduction and catalogue text written by Herbert Read. 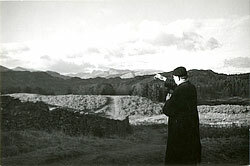 Kurt Schwitters moves with Edith Thomas to 2 Gale Crescent, Ambleside, in the Lake District. Meets the teacher Harry Bickerstaff and the artist Hilde Goldschmidt. Earns his living by painting portraits, landscapes and still-lifes. Financial assistance afforded by his friend Walter Dux, a Hanover industrialist and fellow emigré living in London. Travels to London to attend the wedding of Ernst Schwitters and his second wife Lola “Eve” Mehrgut from Hamburg. Death of his mother Henriette Schwitters. Trips to London as well as Manchester, Liverpool, Southport, Blackpool, Preston and Penrith undertaken for portrait commissions and in order to buy paints. 13 poems published in Carola Giedion-Welcker’s Anthologie der Abseitigen - Poètes à l’Écart, Benteli, Bern. Physical collapse due to vascular congestion, which also causes him to lose his sight for a period of four days. Moves house to a lower location in Ambleside (4 Millans Park) in consequence of this illness. Works on the periodical PIN planned with Raoul Hausmann. Included as a non-member in the annual show of the Lake Artists’ Society in Grasmere; represented again (as a member) in 1947; after his death, works are exhibited likewise (in 1948). Confined to bed for several weeks due to a break of the neck of the femur (on 8 October); increasing financial difficulties. Two Merz evenings staged at the London Gallery (5 and 7 March). Futile attempt to persuade the BBC to record his Ursonate. Travels to London with Edith Thomas; suffers attack of asthma; spends two weeks recuperating in Broadstairs. His grandson Bengt Schwitters is born in Bærum, Norway. 60th birthday, is awarded a fellowship of US $ 1,000 by the Museum of Modern Art, New York, originally intended for the re-building or continuation of one of the Merz buildings in Hanover or Lysaker; uses the award for work on a new Merzbau, the Merz Barn, on Cylinders Farm, which belongs to Harry Pierce near Elterwater in the Lake District. Suffers a haemorrhage; work on the Merz Barn is interrupted. Article Kurt Schwitters. Konstruktive Metamorphose des Chaos by Carola Giedion-Welcker published in the Zurich newspaper Die Weltwoche on the occasion of Kurt Schwitters’s 60th birthday. 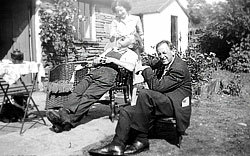 Kurt Schwitters’ dies in presence of Edith Thomas and Ernst Schwitters in Kendal Hospital. Causes of death are acute pulmonary oedema and myocarditis. Buried in St. Mary’s cemetery in Ambleside. Remains transported to the Engesohde cemetery in Hanover; the grave in Ambleside is left in place, together with the gravestone erected by Edith Thomas in 1966.